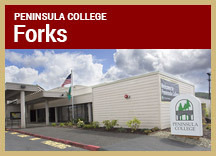 Located on the Olympic Peninsula of Washington State, Peninsula College is situated in a very special environment that provides unique educational opportunities for its students. Depending on the season, it is not unusual to find professors conducting their classes in the middle of the college quadrangle or on our spacious lawns or even taking students on field trips to the nearby ocean, Olympic National Park (a United Nations World Heritage Park), or the peninsula's rain forests to discover and study native marine life, fauna, and flora in their natural habitats. On your own or as a member of one of our many student clubs, you can discover snow-capped mountain peaks, waterfalls, glaciers, and wildlife preserves. The result is an educational experience rivaled by few other colleges or universities anywhere. Cultural opportunities also abound. 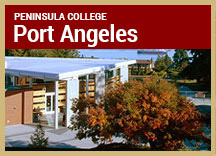 Port Angeles is home to a fine symphony orchestra, a light opera association, an exceptional art museum, a community theatre, and numerous art galleries. 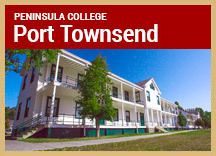 The nearby towns of Sequim, Port Townsend and Forks support active theatre and arts groups, dance troupes, art showings, regional museums, Native American artisans, and numerous festivals and special events throughout the year. Even more cultural opportunities await you in the nearby cities of Seattle and Victoria and Vancouver, British Columbia, Canada.